Monday, July 9, was a very long day for Scott. Tuba City is almost a 3 three hour drive one way from Tse Bonito and on the far western border of the ‘Rez’. It was a time sensitive project that needed completion to replace a piece of equipment that was just repaired, and then get the ‘loaner’ returned ASAP. It was supposed to be a simple task, albeit on the opposite side of the Rez, but God was at work (always…). After completing the exchange of equipment, he decided that trying out the ‘newer’ transmitter that was installed last month might be interesting since it had failed to come online due to some unknown issue, and was now just sitting idle since then until it could be addressed. After a final check up of the connections and punching over the transmitter antennae switch, he pulled up the breaker and the ready light came on with a bright green glow. Nothing left to do but hit the Yellow low power button and wait for the immanent fireworks of the previous month. Praise the Lord it worked! Still waiting for the issue to rear its head once again, but thanks to God’s control over every situation, the transmitter is up and running at the full 250 watts of AM power that it is supposed to and is reaching farther across the reservation to the east and North, westward to the Grand Canyon, and south to Flagstaff. 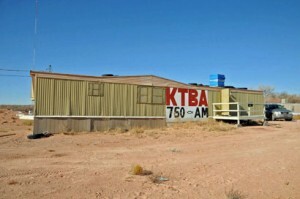 Your consistent prayer and financial support is making it possible for the Navajo and many others to hear the good news over the airwaves once again around Tuba City.